Ukraine has introduced a new system of biometric control for foreigners entering Ukraine as of January 1, 2018; it is applicable to citizens of 70 states designated as countries of "migration risk," Russia is among them. Biometric monitoring systems will operate at 157 international border crossing points, including airports. It not only allows the Ukrainian security agencies to control the length of foreigners' stay in the country, but is also connected to INTERPOL's databases. Read alsoBiometric passport control for Russians to be introduced earlier than planned, from Dec 27Such data will be gathered by the National Verification and Identification System of Ukrainian citizens, foreigners and stateless persons. Border crossing rules for Russian citizens will be even tougher: along with biometric control at the border, they'll need to additionally register in the corresponding electronic system before visiting Ukraine and notify about their visit at least a month before. Further, the Ukrainian authorities planned to introduce mandatory registration by Russians at the place of stay in Ukraine and inform in detail about the route of their travel through Ukrainian territory. However, only the verification of biometric data will work to the full extent from January 1, 2018. 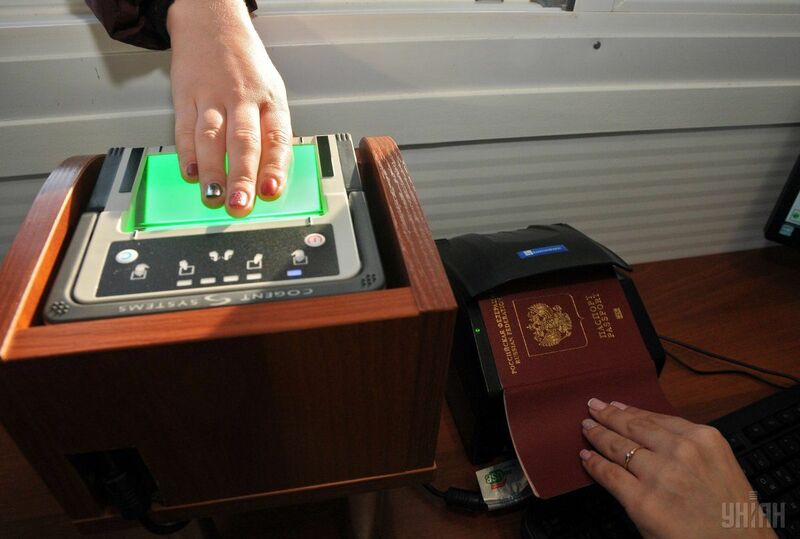 Read alsoBiometric control launched in test mode at Ukraine border checkpoints"Ukraine has not yet decided which agency will be in charge of preliminary electronic registration. Moreover, this issue has not been regulated legislatively, so there is no understanding of how this decision should be implemented," a source in the Foreign Ministry told the news agency RBC Ukraine. Foreigners and stateless persons of the following countries are subject to obligatory scanning of biometric data at the checkpoints across the state border of Ukraine: 1. Algeria, 2. Angola, 3. Afghanistan, 4. Bangladesh, 5. Benin, 6. Botswana, 7. Burkina Faso, 8. Burundi, 9. Vietnam, 10. Gabon, 11. The Gambia, 12. Guyana, 13. Ghana, 14. Guinea, 15. Guinea-Bissau, 16. Equatorial Guinea, 17. Papua New Guinea, 18. Djibouti, 19. Eritrea, 20. Ethiopia, 21. Egypt, 22. Yemen, 23. Zambia, 24. Zimbabwe, 25. Iraq, 26. Iran, 27. Jordan, 28. Cape Verde, 29. Cameroon, 30. Kenya, 31. Kyrgyzstan, 32. The Comoros Islands, 33. The Republic of the Congo, 34. The Democratic Republic of the Congo, 35. The Democratic People's Republic of Korea, 36. Côte d'Ivoire, 37. Lesotho, 38. Liberia, 39. Lebanon, 40. Libya, 41. Mauritania, 42 Madagascar, 43. Malawi, 44. Mali, 45. Morocco, 46. Mozambique, 47. Namibia, 48. Niger, 49. Nigeria, 50. Pakistan, 51. Palestine, 52. The Russian Federation, 53. South Sudan, 54 Rwanda, 55. Sao Tome and Principe, 56. Swaziland, 57. Senegal, 58. Syria, 59. Somalia, 60. Sudan, 61. Sierra Leone, 62. Tajikistan, 63. Tanzania, 64.Togo, 65 Tonga, 66. Tunisia, 67. Uganda, 68. The Central African Republic, 69. Chad, 70. Sri Lanka. Collecting biometric data from other foreigners and stateless persons at the checkpoints across the state border of Ukraine will be based on the results of analysis and risk assessment, the Foreign Ministry noted. At the same time, Ukrainian citizens who arrive from the occupied areas will not be subject to biometric control. "This will not be introduced at the administrative border with the occupied areas, as citizens of Ukraine live there. Russian passports issued in Crimea are not considered a legal document, but if a Russian citizen arrives by a ferry crossing service and wants to get to mainland Ukraine through the administrative border, he or she violates Ukrainian legislation because they have travelled via a closed border checkpoint. They will be refused entry into Ukraine and will most likely be barred from entering Ukraine for three years," speaker for the State Border Service of Ukraine Oleh Slobodyan told Espresso.TV. The following groups of travelers will not be subject to scanning of biometric data: heads of state and government of foreign countries, members of parliamentary and government delegations, technical personnel serving such delegations (persons) and members of their families who arrive in Ukraine at the invitation of the President of Ukraine, the Verkhovna Rada or the Cabinet of Ministers, the Verkhovna Rada of the Autonomous Republic of Crimea or the Council of Ministers of the Autonomous Republic of Crimea, ministries, other central agencies of executive power of Ukraine; persons and family members of persons who arrived in Ukraine on the basis of authorization documents of the United Nations and organizations of the United Nations system; foreigners or stateless persons under the age of 18; foreign tourists who travel on a cruise; members of the crews of foreign warships (aircraft) who arrive in Ukraine in keeping with established rules; persons who are members of the crews of foreign non-military vessels; persons who are members of the crew of civil aircraft of international airlines and international trains, in case of staying at airports or at railway stations indicated in schedules; heads of foreign diplomatic missions and consular offices, members of diplomatic staff, consular officials, administrative and technical and maintenance personnel of diplomatic missions and consular offices, employees of the military attaché offices and trade missions, as well as their wives (husbands), children, parents; employees of foreign affairs agencies of foreign states who arrive in Ukraine on a business trip and have a diplomatic or service passport, and members of their families; officials of international organizations that arrive in Ukraine on a business trip, employees of representative offices of such organizations in Ukraine, as well as employees of representative offices of states under international organizations that have headquarters in Ukraine and enjoy diplomatic privileges and immunity in accordance with the statutory documents of these organizations or relevant international treaties, as well as members of their families.